Chiamaka Obiolo was ready to start high school at Boston Latin Academy four years ago when she was diagnosed with severe scoliosis. After undergoing a 10-hour-long corrective surgery, the Dorchester teenager had to learn to walk, eat, and dress herself again. She credits science for saving her life. “If there had not been research on scoliosis and how to fix it, there would have been no way for me to be treated, and my spine would have continued to curve,” said Obiolo, 17. “I probably would not be alive.”Obiolo became a climate change activist and was one of nearly a dozen speakers at the Stand Up for Science rally in Copley Square on Sunday, joining hundreds of scientists in white lab coats and supporters to protest President Trump’s efforts to discredit science and climate research and dismantle scientific institutions in the government. “The good news of science is not exclusive to the elite and thus its message must permeate throughout the masses and empower everyone from the youth to the elderly,” Obiolo, an aspiring scientist, told the crowd. 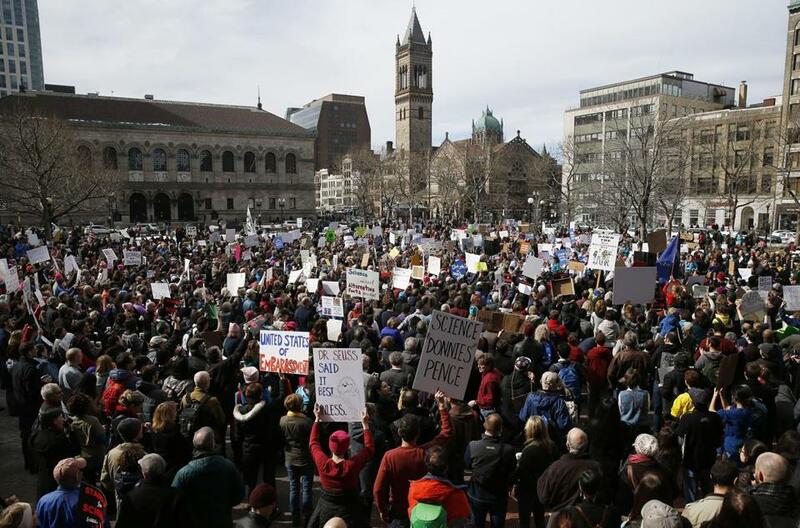 Hundreds of people attended a rally in Copley Square Sunday in a call to fight against President Trump’s efforts to discredit science. The rally coincided with a gathering of thousands of scientists in Boston for the American Association for the Advancement of Science annual meeting, at the Hynes Convention Center. Some of them, like Dr. Bish Paul, walked over from the conference to the rally. Paul, 32, a molecular biologist who lives in Seattle and a gay immigrant from India, said he represents an intersection of groups that have been under attack by the Trump administration. 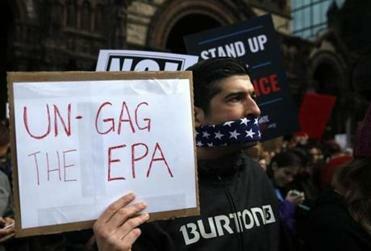 Activists are also planning a national rally in Washington D.C. this spring. The March for Science campaign is mobilizing for a march on the National Mall on Earth Day, April 22. The campaign has attracted 1.3 million supporters on social media so far. 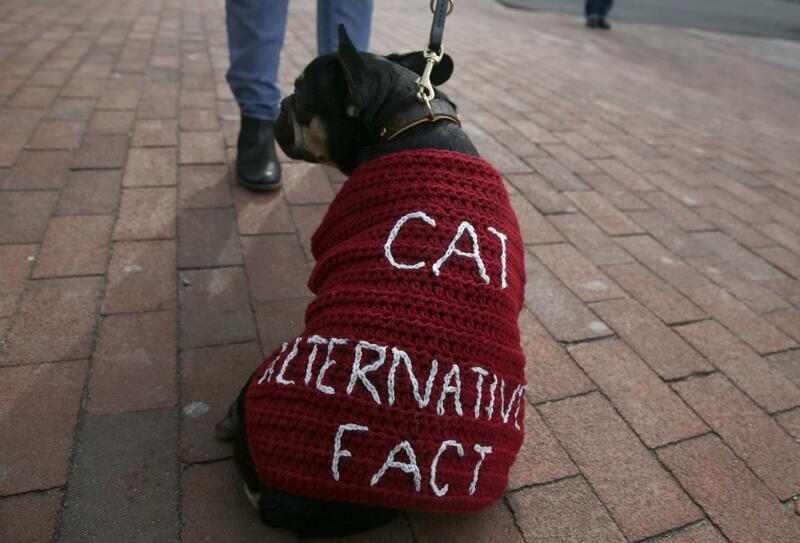 Beka Economopoulos, director of the pop-up Natural History Museum and one of the event organizers, said scientists are real-life superheroes and the administration’s attack on science is a threat against society. 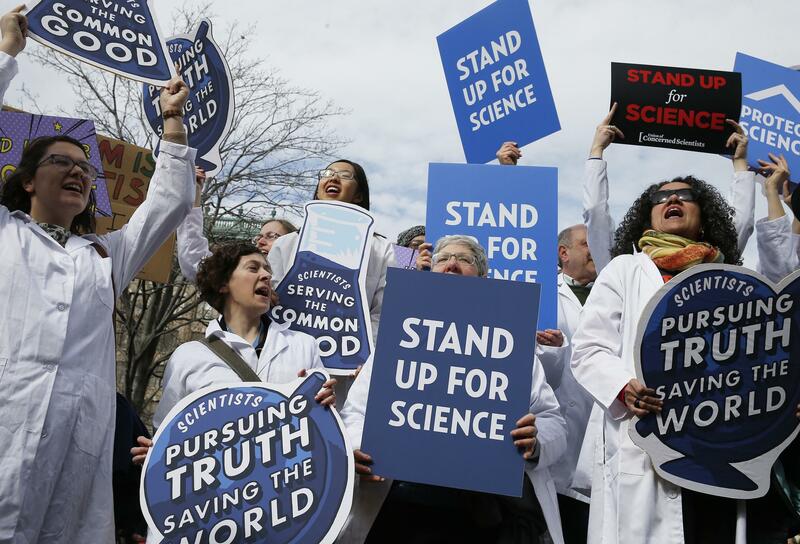 Economopulos said she had hoped to highlight the evidence of climate change and call on the Trump administration to support the scientists whose research has proved beneficial in health- and environment-related issues. Dan Riles, 46, held a cardboard sign above his head that read: “My mother and grandmother are scientists.” Riles’s mother was among the scientists to produce the first mapping of a complete genome, he said. “Even if you don’t see where science is going, it’s important to continue it,” he said. His daughter, Rose Freedman-Riles, who was standing by his side, said she wanted to attend the rally with her father so that she, too, could stand up for science. Obiolo said the threat against science is a social justice issue. She said half of her classmates in elementary school had asthma, and she sees how pollution and climate change have affected minority neighborhoods in Boston. “I wondered how I might be different if my recovering body could breathe in clean air,” she said. She urged rally attendees to ally with other movements, such as Black Lives Matter. The dog is named Louis Vuitton and he is dog, not a cat. Jessica Rinaldi/Globe Staff. Evan Allen of the Globe staff contributed to this report. Jan Ransom can be reached at jan.ransom@globe.com. Follow her on Twitter @Jan_Ransom. Cristela Guerra can be reached atcristela.guerra@globe.com.